Since the adven t of tai tai-hood, I've been channelling my creative energies into the culinary area. Recent successes include a really simple prawn and capsicum fried bee hoon and this was an easy to throw together dish but still very satisfying and a crispy batter fish and chips (a little baking powder dissolved in vinegar did the trick I believe. Must be the addition of carbon dioxide through that method, no need for a soda siphon to pump in CO2, Heston Blumenthal-style) But I had scoffed that meal down so quickly, I had forgotten to take any pictures. The cleaning up of the kitchen was much less fun than the eating, the oil had splattered everywhere and I had to get rid of evidence of unhealthy deep-frying before the Food-Nazi gets home. Then I had this craving for a McDonald's Fillet O Fish for a few days and of course we know, Maccas is banned in this household by the Imperial Edict of the Food-Nazi. As such, we made our own delicious Barrumundi fish fillet burger over the weekend, with a generous slather of tomato chutney, with rocket leaves piled high. This was a really gourmet-tasting fish burger, Barrumundi really hits the spot. I've also been thinking about the Japanese omurice, although I can't remember ever ordering it in a Japanese restaurant. It's one of those simple home-whipped-up dishes that no self-respecting Japanese person would order in a restaurant. So I googled up a recipe - it's really very basic and threw in some smoked salmon I had in the fridge as there is NO meat. Once again, lovely red capsicum for colour and flavour and some frozen peas. However, it wasn't as tasty as I had hoped for. I think more tomato ketchup is needed. Next on my cooking agenda is bread-making. Will get onto that towards the end of the week cos the Food-Nazi can only eat baked goodies on the weekend and I like to share my goodies (and the calories). I have a ne w love. It is an art deco building. A cinema to be exact, the Orpheum Hayden in our neighbourhood. The first time we set foot in it, we were suitably awed and felt like we were transported into the golden age. I particularly love the lights. This feeling was heightened recently when I took the inlaws to the Wednesday movie luncheon to watch "Cheri" (how fabulous is Michelle Pfeiffer and the ability to age gracefully like that?). It was not just a movie, no indeed, I was disabused of that when we entered the foyer to the cinema. There was a silver-haired gent in a suit and bow tie playing the grand piano. Lovely tunes of yonder years wafted while we went in to take our seats. Once again, I gaped at the beautiful light fixtures and the red velvet drapes that were mechanically lifted in scallops. There was a host (yes this was not just a regular movie-going experience as I've mentioned before) who went on stage and bantered with the mostly silver-haired, Caucasian crowd. 5 pairs of movie passes were given out in a movie-themed quiz, after he welcomed various OAP groups who were there as an outing of sorts. Then he introduced the organist, as he rose up from the stage in a deus ex machina. How dramatic! And then he played some swing tunes before being lowered again into the stage and the movie proper followed. Lunch was a sandwich bask et served inside the movie hall itself. We helped ourselves to coffee and tea at the foyer where the pianist was playing again. Helen, my MIL knew all the words to the songs, I was told this was how going to the movies was in the good old days. I am pleased that some nostalgy has been preserved in this lovely building. There is such pleasure in the past, even when one has not lived in it. We've had a few really sunny days here coupled with some lovely warm nights which created a false expectation that Spring or even Summer is here early this year. I mean who has 27C in the winter? And people walking around in singlet, shorts and thongs? Who??? I guess Sydney, that's who. Of course we celebrated the sunny weather with some typical summer activities. With the inlaws in town last week, we traipsed off to the North Sydney Farmers' market and got some nice spinach and fetta sourdough, lovely honey and garlic smoked trout, blue cheese, avocado and tomato and headed out to Balmoral beach for a picnic. Perched on the wooden bench with the warm sun beating down on us, it was a great way to spend a Saturday afternoon. The following day saw temperatures soaring up to 27C and we headed down to the quaint little Southern Highland towns of Bowral and Berrima. Eatin g, drinking, exploring cute shops and bakeries and trawling through lots of antique shops with amazing inventory, made for a very interesting way to spend our time. I learnt a few new things including what an "anti-macassar" is. For those who are interested, it's a cloth cover placed on the back of chairs to prevent staining by hair cream (called macassar oil). We also drove up to the Blue Mountains where Neil, my father-in-law was the only person there wearing shorts, just because he's from the S outh Island and was warm enough even though we were up on the mountains. Even though it was quite sunny (but still relatively cool up on the high altitude), the rest of us preferred to protect our legs with more clothing. The lovely cooperative weather meant that it was perfect for us to take our out-of-town visitors on these day trips and to enjoy the outdoors activities. The Kiwis basked in the sun and tried to retain that warm feeling before they head home the following week into the cold. This summery weather has also tricked plants into flowering early. I've seen lovely cherry blossom trees blooming everywhere on our street. Crowned with lovely, big, pink flowers, they were a sight to behold. Pretty blooms of orange and yellow flowers were also sprouting up on neighbourhood garden lawns. Nature's beauty is everywhere. Spring will be here soon cos it seems like summer is already! Ever since I've discovered how easy it was to whip up vegetable soups, I've been making them at alarmingly short intervals - at least once a week. Carrot, carrot-ginger, pea, cauliflower are the 4 varieties I've tried so far. All so simple, but yet especially warming in the winter. For tonight, I made a pot of carrot-ginger soup and as an accompaniment, I am planning to make some oven-baked zucchini frites ala Firefly, the little, hip bar-restaurant where we get our delicious, thin-crust gourmet pizzas at $10 a pop if we go between 4-6 pm. 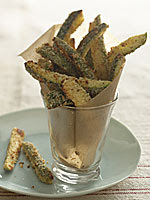 I am not all that fond of zucchini when just simply cut and boiled/steamed, they taste a bit ... nothing. But I am partial to zucchini bread (which is really a misnomer as it is actually more of a cake) and these frites cos they are so much tastier (and probably a thousand calories more than the plain boiled, boring version). So bring on the veggies I say! Being an inve terate collector of vintage glass and ceramics, I love trawling the flea markets and op shops. What greater joy is there than finding a lovely, old item for a bargain price? Bumping into a garage sale with really good vintage items is also a fortuitous event and I've scored a few treasures in garage sales too, most notably my blue glaze Steve Sheridan salad bowl for a meagre $10. Most recently I've obtained a large, clear glass lemon juicer. This is actually not my first choice because I've had my eye set on a green Depression glass juicer and measuring cup set at the Antiques Centre. But I wasn't that keen on the price of $45 and so had been looking out at markets and op shops for something similar. 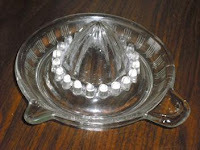 Unfortunately, the search has been futile so far and I've seen a few clear glass lemon juicers but no green Depression glass ones. Having passed up on several of these clear glass ones, I finally decided that I would have to get one and not have any regrets in the future, for missing a good buy with this one at only $3 on one of my quick nips into the neighbourhood Vinnie's shop last week. I'm going to use it to squeeze the oranges when I make my orange cupcakes, see they aren't just objects of beauty to be collected and admired. They are functional and I will love the feel of the heavy glass in my hands and am finally going to put the green plastic juicer I have, into retirement. I've had very memorable meals at swish restaurants but sometimes, it's the meals at the dingy coffee shop with the cook frying up a storm in front of you, that seem to taste so much better. This is especially true in Penang, a foodie heaven. E ating at such hole-in-the-wall places , especially when one is no longer very accustomed to, takes some getting used to. The eating experience will be improved if you keep your eyes away from the ground, try not to look at how dirty the floor is. Looking at the cracked and peeling walls is all right because that is distracting without being disgusting. Observing how the hawker is banging away at the wok also adds to the whole experience as sound and not just sight, is at work, and then you get the whiff of delicious food as he/she plates it up. The Penang char kway teow at this coffee shop boasts of generous serves (3 here) of fat, juicy prawns. The portion overall is not big but is sufficient especially when one orders the delicious "halogen meat" (no idea why it is thus named but it is really a kind of sausage) or "lor bak" as a side dish. The lor bak and prawn fritters are the best I've had on this trip. 1 of the things that I've been looking forward to and which I savour in my memory, is this cold, slippery, yellow dessert, "kee kueh" ("kee" being yeast in Hokkien, makes me wonder if indeed yeast is used but it sure doesn't seem so). Its consistency is like agar-agar and is rather tasteless on its own, so you eat it with a thick and rich brown sugar syrup (gula melaka). I really wanted to go back another day to get another helping but regrettably, didn't get the chance to. Another dessert which of course one cannot miss on a trip to Penang is the famous Chendol. This is a shaved-ice mountain drenched in coconut milk and brown sugar syrup piled over the green starchy, wormy bits and well-cooked and almost mushy sweet red beans. Finally, the foodie's tour of Penang's hawker stalls cannot b e complete without a bowl of the sourish Assam laksa. This is different from the rich coconut version which is more prevalent in Singapore, Malaysia and even Sydney. This is a sourish tamarind soup with fish flakes flavouring the dish, with bits of pineapple, ginger flower, cucumber shreds and a bit of lettuce. And so satiated, I finish my 4-day trip with at least 1 kg more than when I arrived. All well worth it. I don't rec all when I started to have this deep appreciation for old things. My mother always says I like all the old stuff and I refuse to let her throw out dad's old kettle from his university days, his old blood donor card, an ceramic electric jug mum had when she was studying in Melbourne, a 1970s art-glass vase I recall adorning the shelf in our old house and the list just goes on. I've also "called" the 2 1960s teak armchairs that her sister, Kennie gave her all those years ago w hen Kennie moved overseas, and the old Singer treadle sewing machine which mum still sews her clothes on. And I've been promised dad's old Rolex watch which is all scratched and blurry. And so this "Indian Market" we went to in Penang was just another trip down nostalgic lane as such markets no longer exist where I live and the colours, sights, sounds and smells were just lovely to take in. Whether it is a yearning for the days long gone because of the memories associated, the missing of loved ones long passed on, or a love for the simplicity of a time when things were uncomplicated, I do not know. Maybe it is a combination of everything.